Producing replacements in a beef herd is a critical and expensive enterprise for producers. Photo courtesy of Troy Walz. This article is a research summary from 2017 Western Section Proceedings (pp. 119-123), and will be published in the 2018 Nebraska Beef Report. 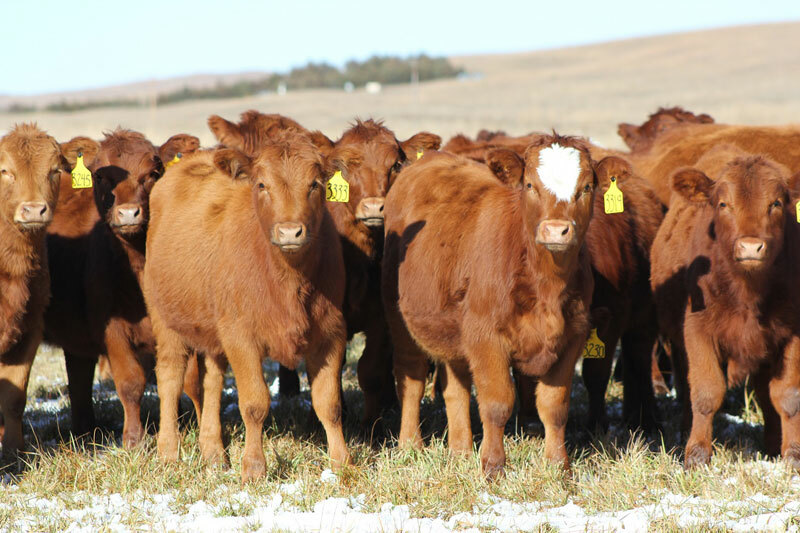 Producing replacements in a beef herd is a critical and expensive enterprise for producers, making more economical heifer development methods needed. Traditional recommendations suggest heifers weigh 65% of mature weight at breeding to maximize pregnancy rates. Lowering target weight at breeding allows heifers to be developed on a lower rate of gain, reducing feed inputs and costs. Previous studies have indicated heifers developed to less than 65% of mature weight have comparable reproductive performance to heifers developed in higher input systems. This study determined how heifer development system impacted subsequent growth and reproductive performance in March and May-born replacement heifers. The study utilized crossbred heifers (5/8 Red Angus, 3/8 Continental). Two hundred twenty five March-born and two hundred fifty-eight May-born crossbred heifers were assigned to one of two postweaning nutritional treatments from mid-January to mid-April. allowed to graze meadow and offered 1 lb/d of the same supplement (MDW). Prior to and following treatment, heifers were managed together within their respective breeding group. Following the study, March-born heifers grazed meadow until June 1 and then grazed upland range. May-born heifers grazed upland range immediately following the treatment period due to decreased meadow availability. Heifers were synchronized with a single prostaglandin (PGF2α ) injection 5 days after bull placement for a 45–day breeding season. All heifers grazed Sandhills upland range through final pregnancy diagnosis. In the March-born heifers, HAY heifers gained more than MDW heifers (1.72 vs. 1.12 lb/d; respectively). However, March-born MDW heifers gained more the month following the treatment period (1.21 lb/d) than the HAY heifers (0.46 lb/d). The increase in average daily gain (ADG) by the MDW heifers is likely from compensatory gain. However, HAY heifers still weighed more than MDW heifers at breeding (705 vs. 672 lb; HAY, MDW). Pregnancy rates were similar (88%) for HAY and MDW heifers. Furthermore, calving rate and the proportion of heifers calving in the first 21 days was similar between treatments. Similar to the March-born heifers, May-born heifers on HAY treatment gained more (1.30 vs. 0.77 lb/d; HAY, MDW) during the treatment period. Also similar, May MDW heifers gained more than HAY heifers following the treatment period, likely due to compensatory gain. May HAY heifers still weighed more compared with MDW heifers at breeding (701 vs. 653 lb; HAY, MDW). Pregnancy rates were also similar (70%) for HAY and MDW heifers. Calving rate did not differ (66%) between treatments, although, the proportion of heifers that calved in the first 21 days was greater for MDW (79%) compared with HAY heifers (64%). Heifer development system did not impact pregnancy rate or calving rate in the March or May replacement heifers. Therefore, a reduced input heifer development system from mid-January to mid-April is a viable option in both early and late summer breeding seasons. However it should be noted, March heifer pregnancy rate was greater (87 vs. 70 ± 3%) compared with May-born heifers. The lower pregnancy rate in May heifers may be due to declining forage quality during the late-summer breeding season.